St. Martin's Press, 9780312362928, 160pp. 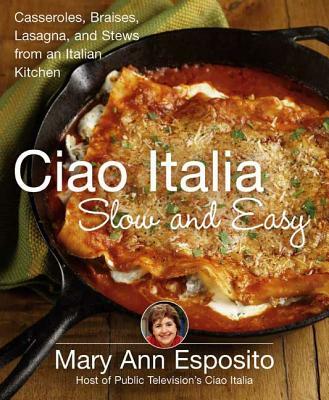 Ciao Italia Slow and Easy is filled with Mary Ann's sensible advice, knowledgeable asides about the history of Italian cuisine and, most of all, a sure sense of what tastes good. Mary Ann Esposito is the host of the long-running PBS series Ciao Italia. She is the author of eleven successful cookbooks, including Ciao Italia Five-Ingredient Favorites, Ciao Italia Pronto!, and Ciao Italia Slow and Easy. She lives in Durham, New Hampshire, with her husband, Guy.